Dem Operative Asks McCain If He Called His Wife a C*nt ...Update: He Ran Biden's Office- Is an Obama Supporter! Dem Operative Asks McCain If He Called His Wife a C*nt …Update: He Ran Biden's Office- Is an Obama Supporter! AllahPundit reported that at a town hall meeting today a questioner asked Senator McCain if he called his wife a c*nt. HotAir discovered he’s a former campaign worker for Joe Biden. Actually, he was the former Biden Campaign office manager. His name is Marty Parrish. 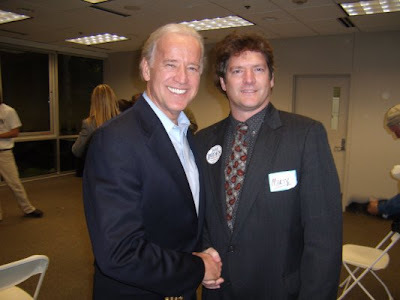 Senator Joe Biden stands with his campaign office manager Marty Parrish. Well, actually he was a the Biden Campaign Office Manager. That was before Smokin Joe got trounced. Now he’s an Obama Supporter! Gee… Do you think if this would have been a Republican operative sneaking into an Obama town hall event asking offensive questions it might get some press? Marty Parrish: This question goes to mental health and mental health care. Previously, I’ve been married to a woman that was verbally abusive to me. Is it true that you called your wife a c*nt? McCain: Now, now. You don’t want to… Um, you know that’s the great thing about town hall meetings, sir, but we really don’t, there’s people here who don’t respect that kind of language. So I’ll move on to the next questioner in the back. He’s busy at work running the Biden campaign office. UPDATE: The Des Moines Register is completely fooled by Parrish and disclosed that Marty passed himself off as press to get into the event. –He signed in as a Huffington Post contributor and handed out Obama literature. Of course, the MSM is totally clueless of his extensive background in Democrat politics! That’s your MSM at work. THERE ARE UPDATES TO THIS STORY HERE.